On April 16th, 2015, Coastal Alabama Partnership (CAP) received two new board appointees to replace Mayor Sandy Stimpson and Joe Bullock. Following three years of service, CAP’s CEO and President Wiley Blankenship awarded Mayor Stimpson and Bullock each with a token of appreciation at the board meeting. 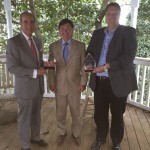 Heiko Einfeld, President of the Eastern Shore Chamber of Commerce, received the award on behalf of Bullock who was unable to attend the meeting. Mayor Stimpson will be rolling off the board into an ex-officio position where he will continue to provide insight and guidance to current CAP board members. At the meeting, Mayor Stimpson stated that he was only rolling off to ensure the integrity of the board as he was elected to office after being appointed to the board. Mayor Stimpson said he “did not know of any other organization as important to this region and these two counties as CAP” and he will continue to be highly involved with its activities. With Mayor Stimpson and Bullock’s resignation, CAP welcomes Frank Lott III and Kerry O’Connor to their Board of Directors. Lott will be representing the Mobile Area Chamber of Commerce and O’Connor will be representing the Eastern Shore Chamber of Commerce. 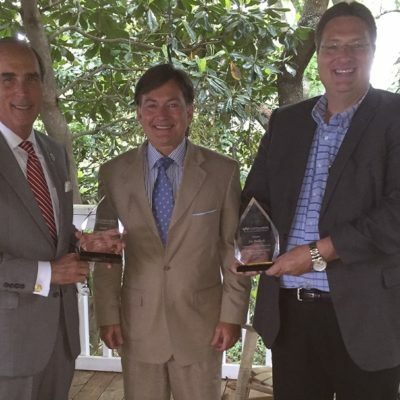 The Mobile Area Chamber of Commerce and the Eastern Shore Chamber of Commerce are two of the nine founding entities of CAP, which promotes unified regional strategic efforts in Mobile and Baldwin counties. Lott graduated from the University of Alabama in 1999, earning a degree in Finance. He is the president of Heritage Homes and chairman of the Mobile Area Chamber of Commerce Board of Directors. He also serves as a board member of the Home Builders Association of Metro Mobile, Goodwill Easter Seals of the Gulf Coast, UMS-Wright Preparatory School, and Trustmark Bank Advisory Board. He is married with two young sons. O’Connor is a native of Mobile and graduated from the University of South Alabama in 1976. 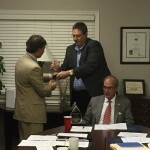 He is the Baldwin County President for BancorpSouth. Other board affiliations include the Eastern Shore Chamber of Commerce, United Way of Baldwin County, Thomas Hospital Foundation, and Baldwin County Economic Development Alliance. He is married to Laura Mostellar O’Connor and has two sons, Kerry Jr. and Matthew. 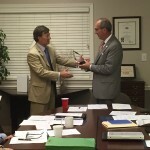 CAP would like to thank Mayor Stimpson and Mr. Bullock for their dedication and service to the CAP Board of Directors. CAP is pleased to have Lott and O’Connor as members of its Board of Directors and looks forward to the continued leadership of Mayor Stimpson as an ex-officio member.